When cold weather is around the corner, it’s important that you find the right boots to keep your kid’s feet warm and dry. At the same time, kids should enjoy wearing the boots, so comfort and aesthetic should be taken into consideration as well. To help you find the right pair, we came up with 10 of the best winter boots for kids, focusing on both functionality and appearance. Recommendation: First on our best winter boots for kids list we have these laced-up winter boots feature a rubber sole that helps them get great traction. Even though they are waterproof to keep kids dry, they could do with some more weatherproofing. They run a bit large, but it grants enough room to either grow in or wear thicker socks. As a plus, the Columbia Youth Boots are built to withstand anything. Recommendation: If you need boots that are easy and quick to put on and take off, the Merrell Moab Polar Boots are the right fit. The Velcro straps are simple for anyone to use. They aren’t heavy so they’re comfortable to maneuver in. However, the material inside can feel a bit rough. Also, their waterproof capabilities are minimal, so if snow does get inside, they can get wet. Otherwise, if they’re dry, they stay rather warm. Recommendation: These snow boots come with both Velcro and a cinch tie on top to aid with a secure fit. Thanks to both the cinch tie and the high cuffs, kids don’t have to worry about snow getting in. Although these youth snow boots are insulated well for warmth, the insoles can still get a bit wet. They do run small, which can make them tight. So buy a size or two up so they can fit for a while and keep kids comfortable. Recommendation: Next on our best winter boots for kids list we have these Kamik winter boots that should hold up well over time. They keep nice and dry, and they even stay clean and don’t hold a smell thanks to the easy-to-remove inner liners. Around the ankles, they may get narrow, so consider buying a size up. In addition, they are stiff so younger kids may have a tough time walking in them. Recommendation: As these boots have good treading on the soles, you shouldn’t worry about your kids slipping in the snow or mud. Their weatherproof capabilities are exceptional so they keep warm and dry. However, these kid boots are not exactly built for those with wider feet, and the faux fur around the heel tends to come undone after a while. Even still, the boots as a whole tend to last well. Recommendation: The Dream Pairs Boys/Girls Insulated Snow Boots are made using quality stitching so they withstand an active kid. They’re comfortable and warm inside. However, the sizing can be off sometimes. Also, the top runs a bit wide, so snow may get lodged. 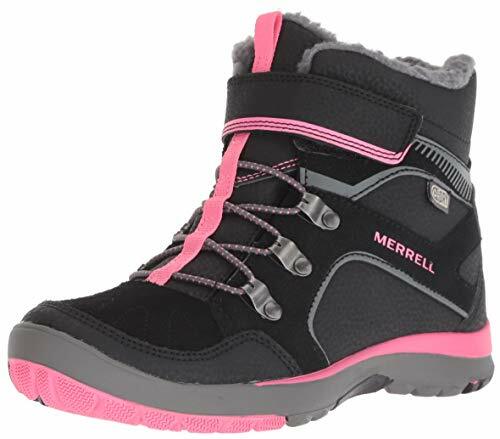 Notwithstanding, these boots are still some of the best winter boots for kids due to their function of keeping feet dry, toasty, and having great treading. Recommendation: With the Nova Mountain Snow Boots, kids can feel free to trudge through puddles and deep snow with no problem. They hold in warmth well while keeping water out. However, for younger kids they might be a tad bulky. Concerning comfort, they may feel stiff at times, but the soft inner lining helps kids feel more content wearing them. 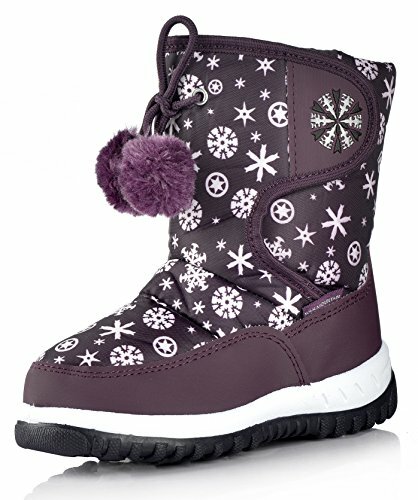 Recommendation: These are among the best winter boots for kids that are both functional and offer a large color/design selection. They’re sturdy to hold up through anything, and the soft insulation should keep feet warm. The traction works extremely well, especially on ice. At the same time, this allows for snow to build up in the soles, so you may have to frequently wipe them out. For some kids, these snow boots can seem a bit heavy as well. Recommendation: With an easy on/off feature, kids should be able to throw on these boots with no difficulty. They are slip-resistant to protect on both snow and ice, and they keep the feet relatively warm. Unfortunately, the Bogs Kids Classic Winter Boots run a bit large, but it can give room to grow. On the other hand, the heel can feel tight for kids. 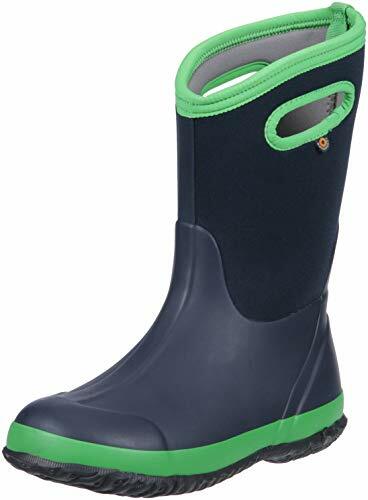 If you want your kid to handle the cold season better, you can also check out the best rain boots for kids. Recommendation: Your kid will love having fun in the snow with these boots, they come with waterproof uppers so no worries about wet feet. These boots are also made from fabric and leather, and they have rubber soles. The inside is made from soft thick faux fur that provides comfort and warmth. They are also easy to get on and take off thanks pt their hook-and-loop closure. Recommendation: Kamik boasts some of the best winter boots for kids who are active and prepared to dive right into the snow. The rubber is thick and holds up well while also being flexible so that walking in them isn’t difficult. They’re insulated well for warmth. However, they aren’t that breathable, so kids may sweat inside them. Also, the removable inserts can be tough to put back in. Cold, snowy weather shouldn’t limit children from playing outside. As such, the best winter boots for kids will keep them warm, dry, and ready to take on anything. If you have younger kids you can also look at our snow boots for toddlers recommendations. Do you have any experience with the boots on our list? Head to the comment section and share your thoughts! Great shoes and thanks for listing their advantages and disadvantages. I like number 10 the most.